Englewood, NJ – Ex-con struggles with cops within reach of stolen guns – now released for FREE under NJ Bail Reform after risk assessment determines he is not a danger to the community. An Englewood ex-con with a criminal record that dates back a decade attempted to disarm cops during an arrest resulting from a SWAT drug raid – all within reach of three stolen handguns, hollow point bullets, and drugs. According to the Daily Voice, Birthwright was released just hours later under NJ Bail Reform and FREE TO GO after after the Arnold Foundation’s “Pretrial Risk Assessment” tool determined he was not a danger to the community or a flight risk and therefore should not be subject to any accountable release – just a “promise” to appear. An Englewood ex-con struggled with police within arm’s reach of three stolen guns – at one point trying to take an officer’s weapon — during a drug-den raid that produced four arrests, authorities said. A Bergen County Regional SWAT Team, along with Dumont and Englewood police, joined county prosecutor’s detectives in the Friday raid of the Thompson Avenue home of Gavin Birthwright, 30, following what they said was a tip about extensive drug dealing there. Birthwright, whose adult criminal record stretches back more than a decade, “fought with police and resisted arrest within reaching distance of three stolen handguns he kept in the residence, along with hollow point bullets, and marijuana,” Acting Bergen County Prosecutor Dennis Calo said Monday. At one point, Birthwright “attempted to disarm a law enforcement officer,” he said. In the bedroom with him was Charle Sampson, a 21-year-old medical billing specialist, Calo said. 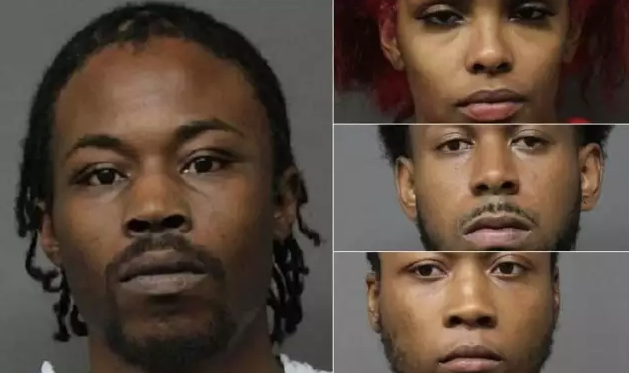 Both were taken into custody, along with two others who were in the home: Deshawn Stephens, 28, who the prosecutor said was carrying several bags of pot, and 21-year-old Jaquis Roberts, who he said had a small amount of marijuana on him. Birthwright was charged with several weapons counts – including being a convicted felon in possession of a firearm – as well as with resisting arrest, attempting to disarm a law enforcement officer and possession of a large-capacity ammo magazine, hollow-point bullets and the pot. A judge nonetheless freed him hours later, under New Jersey’s 2017 bail reform law, pending a detention hearing this Wednesday. Sampson also was ordered released on various weapons, ammunition and drug possession charges. Stephens was released pending an Aug. 8 first appearance in Central Judicial Processing Court in Hackensack on drug charges.